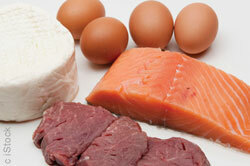 A diet high in protein and fat and low in carbohydrate may increase the risk of developing type 2 diabetes. Researchers followed 66,485 women enrolled in the E3N-European Prospective Investigation into Cancer and Nutrition (EPIC) study over a 14-year period. Women with diets high in meat and low in carbohydrates and plant foods, which the researchers called an acidic diet, had a 56 percent greater chance of developing diabetes, compared with those eating diets high in fruits and vegetables, which the researchers called an alkaline diet. Fagherazzi G, Vilier A, Bonnet F, et al. Dietary acid load and risk of type 2 diabetes: the E3N-EPIC cohort study. Diabetologia. Published online November 11, 2013.